Proteins are the “workhorses” of the body and participate in many bodily functions. Proteins come in all sizes and shapes and each is specifically structured for its particular function. More than one hundred different structural proteins have been discovered in the human body, but the most abundant by far is collagen, which makes up about 6 percent of total body weight. Collagen makes up 30 percent of bone tissue and comprises large amounts of tendons, ligaments, cartilage, skin, and muscle. Collagen is a strong, fibrous protein made up of mostly glycine and proline. Within its quaternary structure three peptide strands twist around each other like a rope and then these collagen ropes overlap with others. This highly ordered structure is even stronger than steel fibers of the same size. Collagen makes bones strong, but flexible. Collagen fibers in the skin’s dermis provide it with structure, and the accompanying elastin protein fibrils make it flexible. Pinch the skin on your hand and then let go; the collagen and elastin proteins in skin allow it to go back to its original shape. Smooth-muscle cells that secrete collagen and elastin proteins surround blood vessels, providing the vessels with structure and the ability to stretch back after blood is pumped through them. Another strong, fibrous protein is keratin, which is what skin, hair, and nails are made of. The closely packed collagen fibrils in tendons and ligaments allow for synchronous mechanical movements of bones and muscle and the ability of these tissues to spring back after a movement is complete. Although proteins are found in the greatest amounts in connective tissues such as bone, their most extraordinary function is as enzymes. Enzymes are proteins that conduct specific chemical reactions. An enzyme’s job is to provide a site for a chemical reaction and to lower the amount of energy and time it takes for that chemical reaction to happen (this is known as “catalysis”). On average, more than one hundred chemical reactions occur in cells every single second and most of them require enzymes. The liver alone contains over one thousand enzyme systems. Enzymes are specific and will use only particular substrates that fit into their active site, similar to the way a lock can be opened only with a specific key. Nearly every chemical reaction requires a specific enzyme. Fortunately, an enzyme can fulfill its role as a catalyst over and over again, although eventually it is destroyed and rebuilt. 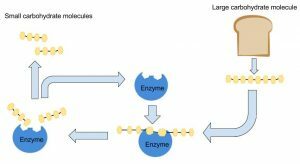 All bodily functions, including the breakdown of nutrients in the stomach and small intestine, the transformation of nutrients into molecules a cell can use, and building all macromolecules, including protein itself, involve enzymes (see Figure 6.10 “Enzymes Role in Carbohydrate Digestion”). Proteins are responsible for hormone synthesis. Hormones are the chemical messages produced by the endocrine glands. When an endocrine gland is stimulated, it releases a hormone. The hormone is then transported in the blood to its target cell, where it communicates a message to initiate a specific reaction or cellular process. For instance, after you eat a meal, your blood glucose levels rise. In response to the increased blood glucose, the pancreas releases the hormone insulin. Insulin tells the cells of the body that glucose is available and to take it up from the blood and store it or use it for making energy or building macromolecules. A major function of hormones is to turn enzymes on and off, so some proteins can even regulate the actions of other proteins. While not all hormones are made from proteins, many of them are. 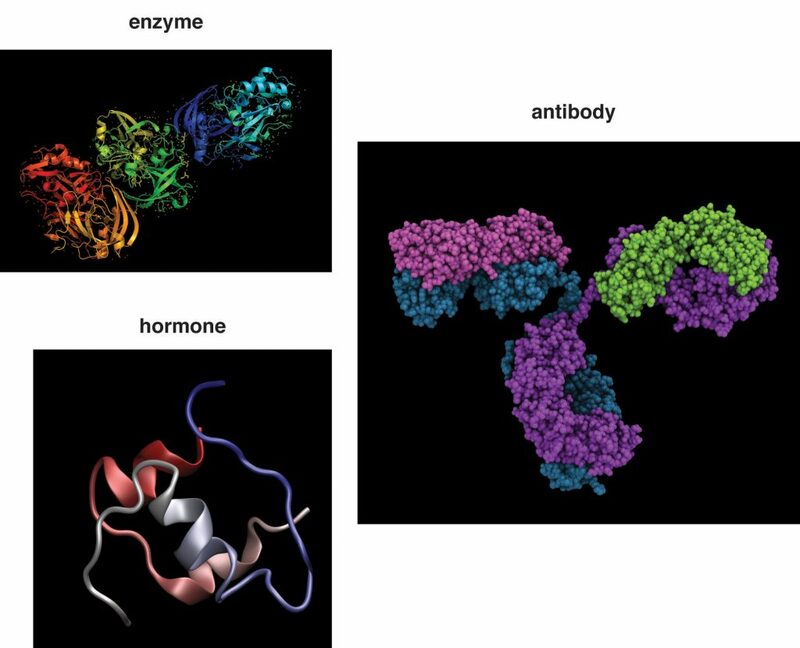 PDB 1o9x EBI by Jawahar Swaminathan and MSD staff at the European Bioinformatics Institute / Public Domain The butterfly-shaped protein, albumin, has many functions in the body including maintaining fluid and acid-base balance and transporting molecules. Protein is also essential in maintaining proper pH balance (the measure of how acidic or basic a substance is) in the blood. Blood pH is maintained between 7.35 and 7.45, which is slightly basic. Even a slight change in blood pH can affect body functions. Recall that acidic conditions can cause protein denaturation, which stops proteins from functioning. The body has several systems that hold the blood pH within the normal range to prevent this from happening. One of these is the circulating albumin. Albumin is slightly acidic, and because it is negatively charged it balances the many positively charged molecules, such as protons (H+), calcium, potassium, and magnesium which are also circulating in the blood. Albumin acts as a buffer against abrupt changes in the concentrations of these molecules, thereby balancing blood pH and maintaining the status quo. 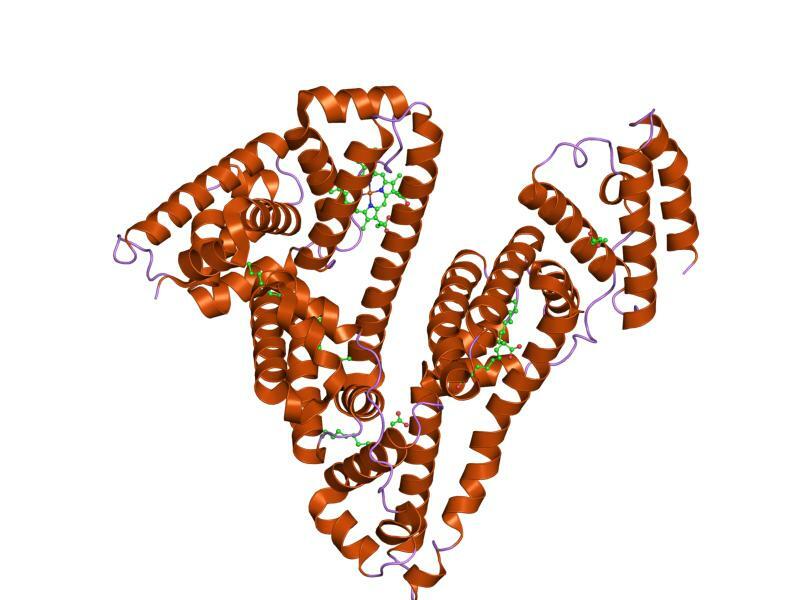 The protein hemoglobin also participates in acid-base balance by binding and releasing protons. 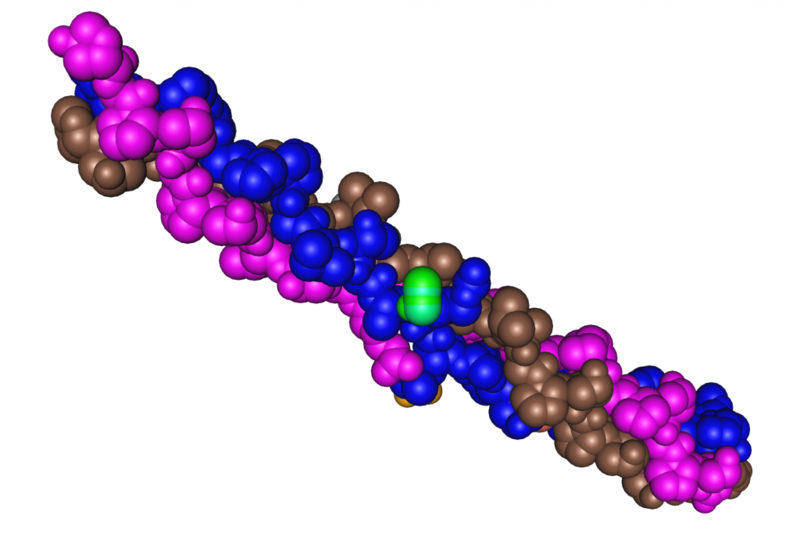 Albumin and hemoglobin also play a role in molecular transport. Albumin chemically binds to hormones, fatty acids, some vitamins, essential minerals, and drugs, and transports them throughout the circulatory system. Each red blood cell contains millions of hemoglobin molecules that bind oxygen in the lungs and transport it to all the tissues in the body. A cell’s plasma membrane is usually not permeable to large polar molecules, so to get the required nutrients and molecules into the cell many transport proteins exist in the cell membrane. Some of these proteins are channels that allow particular molecules to move in and out of cells. Others act as one-way taxis and require energy to function. 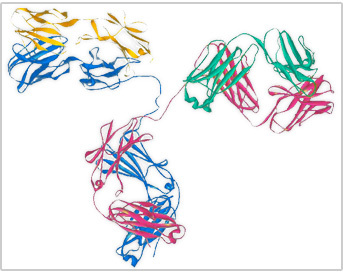 An antibody protein is made up of two heavy chains and two light chains. 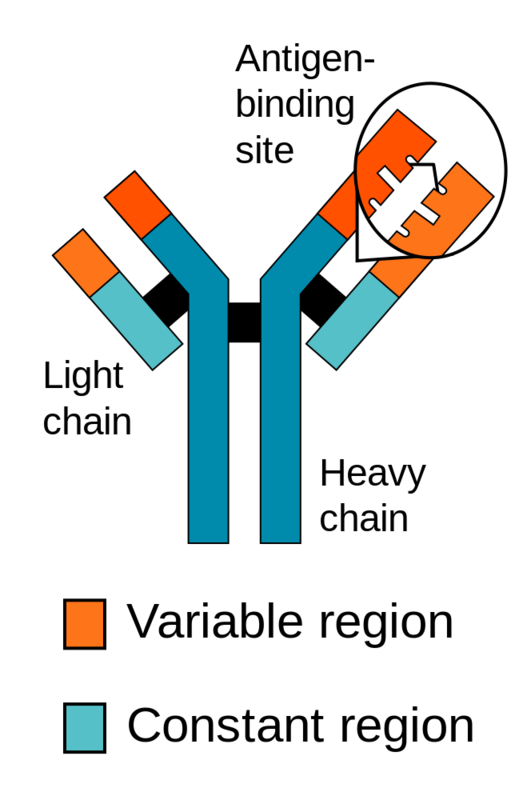 The variable region, which differs from one antibody to the next, allows an antibody to recognize its matching antigen. Proteins are involved in all aspects of wound healing, a process that takes place in three phases: inflammatory, proliferative, and remodeling. For example, if you were sewing and pricked your finger with a needle, your flesh would turn red and become inflamed. Within a few seconds bleeding would stop. The healing process begins with proteins such as bradykinin, which dilate blood vessels at the site of injury. An additional protein called fibrin helps to secure platelets that form a clot to stop the bleeding. Next, in the proliferative phase, cells move in and mend the injured tissue by installing newly made collagen fibers. The collagen fibers help pull the wound edges together. In the remodeling phase, more collagen is deposited, forming a scar. Scar tissue is only about 80 percent as functional as normal uninjured tissue. If a diet is insufficient in protein, the process of wound healing is markedly slowed. Some of the amino acids in proteins can be disassembled and used to make energy (Figure 6.14 “Amino Acids Used for Energy”). Only about 10 percent of dietary proteins are catabolized each day to make cellular energy. The liver is able to break down amino acids to the carbon skeleton, which can then be fed into the citric acid cycle. This is similar to the way that glucose is used to make ATP. If a person’s diet does not contain enough carbohydrates and fats their body will use more amino acids to make energy, which compromises the synthesis of new proteins and destroys muscle proteins. Alternatively, if a person’s diet contains more protein than the body needs, the extra amino acids will be broken down and transformed into fat. 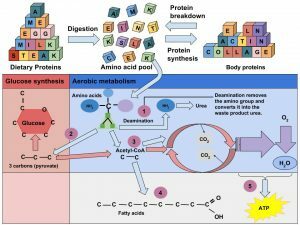 Protein’s Functions in the Body by University of Hawai’i at Mānoa Food Science and Human Nutrition Program is licensed under a Creative Commons Attribution-NonCommercial-ShareAlike 4.0 International License, except where otherwise noted.